Bill Adams writes: When I was approximately 14 years old I spent the summer with Aunt Bert (Henderson) & Cortez and Grady Sconyers. Grady was in the process of building this new Continental Gin. It was powered by a water cooled two cylinder vertical diesel engine in the South end of the building. The engine stood approx. 8 ft high with a ladder to a catwalk at the top. A water vat outside the SE corner of the building cooled the water. North of the engine room were three gins in a row, the overflow room, and two baling presses. Power from the engine was supplied by overhead shafts and belt pulleys. The original building had a shed type roof across the front of the building. The suction tube to unload the trucks was under this roof. There was a concrete loading ramp on the North end by the baling presses. At the start up, I drove a wagon with a pair of mules hauling bales from the ramp around to Gradys’ warehouse at the NE corner of Railroad and Willis Street where they were weighed, and samples taken. In back of the gin was a cotton seed storage building(the seed was blown from the gin to the building). This was considered “state of the art” in the 1940′s. When I was approx. 14 years old I spent the summer with Aunt Bert (Henderson) & Cortez and Grady Sconyers. Grady was in the process of building this new Continental Gin. It was powered by a water cooled two cyl. vertical diesel engine in the South end of the building. The engine stood approx. 8 ft high with a ladder to a catwalk at the top. A water vat outside the SE corner of the building cooled the water. North of the engine room were three gins in a row, the overflow room, and two baling presses. Power from the engine was supplied by overhead shafts and belt pulleys. 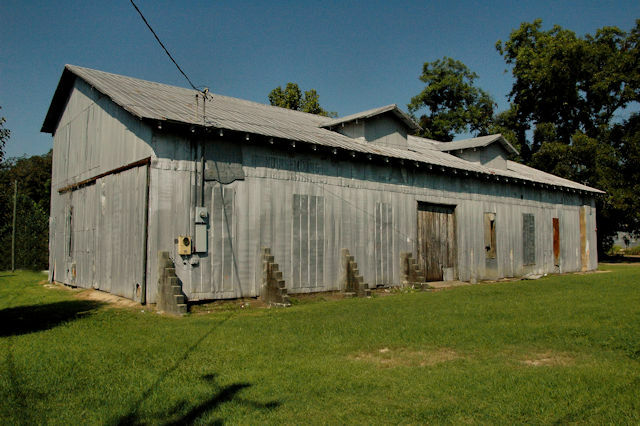 The original building had a shed type roof across the front of the building. The suction tube to unload the trucks was under this roof. There was a concrete loading ramp on the North end by the baling presses. At the start up, I drove a wagon with a pair of mules hauling bales from the ramp around to Gradys’ warehouse at the NE corner of Railroad and Willis St. where they were weighed, and samples taken. In back of the gin was a cotton seed storage building(the seed was blown from the gin to the building). This was considered “state of the art” in the 1940′s.